I know I have touched on her story several different times in this blog, but as the Fall season approaches, I have been given the opportunity to put together an article for the Fall edition Untied Through Pregnancy And Infant Loss quarterly newsletter and Skye and Fall are almost synonymous for me. I also have many new friends and readers who may not have read her story in its entirety and I find that every time I tell it, I have gained a little more insight, a new perspective, remembered certain parts a bit more clearly. Thank you for letting me tell her story again, remembering her is something I need to do. It has given me an opportunity to shed fresh tears and clean out my soul. When you think about that season, the very essence of it, what do you see? For those of us in temperate regions of the Northern Hemisphere, images of earthen tones, piles of crunchy leaves, vibrant colors, crisp air, spiced apples, great big pumpkins – even our southern, warm weather friends can relate to these mind pictures. For me specifically, when I close my eyes and think of that fleeting, glorious season known as Fall, I see the most vibrant blue skys, the ones you see on a cloudless, late September day, the kind that are crisp and cool and thrill your senses with barely discernible scents like fresh air and crispy maple leaves, the kind that leave you with an unexplainable longing to explore, to jump in your car and drive to you know not where, it just leaves you with an itch to go and enjoy and live. Fall has always been my very favorite season. Very early in 2008 I found out the joyous news that we were expecting our first child. My husband and I had been married just over a year and had decided we were “ready” to start a family. (You’re never really ready.) Almost immediately we got pregnant with our much-loved, much-anticipated, first baby girl. Of course, we didn’t find out until much later that we were expecting a girl, but I already had her name picked out. Finding out I was due in the Fall only cemented my choice, and being due in my favorite month, September, was the cherry on the sundae. Her birthstone would be my favorite gem stone, a sapphire, which was my favorite color, and I would name her Skye. My husband, being the traditional type, wasn’t crazy about my pick. In fact, he tried to persuade me that it wasn’t a good name for our child, too unusual. He liked Elizabeth. I stood firmly, we fought for a while about it, then we decided we would name her Elizabeth Skye, but we would call her Skye. All this before we found out we were even having a girl! Maybe he thought we would have a boy and solve the problem so it didn’t matter if he gave in. At 22 weeks we had the ultra sound that would tell us if we were going to welcome a boy or a girl. I remember that day, one of the few from that pregnancy I remember vividly. We held each others’ hands and his trembled a little – or was that mine? We both strained to make heads or tails of the tail end of our tiny squirming miracle represented by light and dark patches on a grainy screen. It took only a moment for the tech to confidently point out proof that we were having a girl. Of course, as parents you always say it doesn’t matter, you just want a healthy baby, and I was sure I felt the same until the surprising feelings of joy and relief flooded through me. I looked at my husband and there wasn’t even a trace of disappointment, only joy and surprise and was that a hint of terror? Being from the deep south, I saw him already mentally loading his not yet purchased shot-gun as a teen boy approached his imaginary door. That pregnancy was perfect, utterly perfect. I was never sick, I was never tired, every prenatal visit was fine, every test came back normal. I lost weight and never really gained it back, but having started with extra meat on my bones, I wasn’t alarmed and attributed it to my rigorous schedule opening and running our first restaurant (my hubby is a chef) in a new state away from our family and friends. I didn’t have time for being tired, I didn’t have time to eat, and regrettably, I didn’t have time to enjoy the miracle growing inside me. I lost 30 lbs. in my first 20 weeks. My midwives didn’t seem alarmed since I had started over weight and I was eating healthy when I was eating, as well as taking my vitamins religiously. Honestly, I felt good. I felt like I would be able to recognize if I needed to slow down or take it easy, but in retrospect, even though my actions during pregnancy did not cause my daughter’s condition, I can’t help but think I didn’t know my limits. Things were relatively ok until month 8. That’s when our life began tumbling down around us in a truly catastrophic way. Because we were young (23 and my husband was 25) and a bit naive, we had made some bad decisions in choosing business partners. Funds that had been promised never materialized, no signatures had been obtained, and a month after opening (and doing well enough to draw customers by word of mouth alone from several hundred miles away) we were forced to close due to complications from a bunch a little things, mostly inferior equipment and no money to fix or replace the items, as well as faulty wiring in the building that had not been designed to handle commercial electricity needs, something we found out a month after opening. Again, the funds were unavailable to fix the problem. So here we were, way out in South Eastern Colorado, thousands of miles from our families in Kentucky. Our business wasn’t working out and every last penny we had was exhausted. I was 8 months pregnant and worn completely out. The only job my husband could get was 100 miles away ONE WAY and gas was averaging $4.50 a gallon. Even with our little Kia, it was just too far a drive to balance the budget on what he was making and we had another decision to make. We didn’t have enough money to move closer to his new job and we surely didn’t have the heart. We needed to be close to our families to regroup and find support during this devastating time. Of course, we didn’t have the funds to move back home to Kentucky and we had already gotten so much financial help from our families, more than they had to spare even. So I sold my furniture. We didn’t have much, but we had a very nice couch and recliner, a coffee table, a bed, a tv, a few other things. I sold what ever I could because we needed the money to move home and we had to pull a tiny U-haul trailer behind our car and all we could fit was the little bit of baby stuff we had accumulated and our clothes. In fact, after selling everything, there was still some stuff we had to just get rid of because it simply wouldn’t fit. Among these things, my beloved piano that had somehow made it with me through thick and thin and several moves since I was 15. When we got back to Kentucky my husband started looking for a job. He found one right away and was told they would call him with his first schedule the next day. They didn’t, for a whole week he waited on this job he had been told he had. Finally, he started looking again a week later. Being in a rural country area, there weren’t a lot of places looking to hire a chef and certainly not at the price we needed. He finally found one and started work 2 days before I went into labor. It didn’t pay much, but at that point anything was more than we had. I went into labor on September 24th. I knew right away that I was in labor. I had helped my mom and dad deliver 4 babies at home and my mom had done wonderful mental preparation for me. In fact, between my mom having five healthy children at home and my husband”s previous experience as a paramedic, and considering everything we’d just been through and not having a lot of time to switch insurance, we had decided to have Skye at home. At that point it seemed like the most natural and right thing. I personally knew at least 20 different children from several different families who had been born at home, ranging from first baby to number 10. I knew birth to be perfectly natural, women had been doing it for thousands of years and I knew I could do it too. I still don’t regret the decision. It gave me 24 beautiful hours of closeness and perfect time that I needed for what would lie ahead. My husband was there, and my mom, who had always been my best friend, was there to coach me and help me and I didn’t see why we wouldn’t soon be holding our perfect baby girl. I labored for 12 hours before my water broke on its own, then the labor really picked up. Through the night I labored. At one point I thought I was feeling the urge to push. It was a lot of pressure, but being my first baby, I didn’t realize I was just feeling pressure. I started pushing way too early. Of course after several hours I had exhausted myself and there seemed to be no progress. My mom had her home births with her 4th – 8th babies, it had been a while since her first, over 20 years, and she had somewhat forgotten how different a first was as opposed to your 8th. My husband had been present and helping with 2 emergency births, but he had not endured the labor part, only the delivery. I personally felt worried by this point. The whole pregnancy I had experienced a tiny nagging feeling that something would go wrong. Mostly I had been able to shake it off as first time mom fears, but as I pushed and my baby didn’t come, I got worried and said we should go to the hospital (which had always been our plan if something went wrong). My husband immediately agreed. It was somewhere around 10 am on September 25th, 2008. As soon as we got in the car and started the 20 miles to the nearest hospital I felt the real urge to push. I know it was God’s provision, He let me get it wrong with the pushing so we would go to the hospital, I know this in my heart. I don’t know how I made it 30 minutes riding in a car without delivering that baby. It seems we got stuck behind every tractor on the 2 lane road, it was a weekday during prime harvest time in rural Kentucky. My contractions were coming fast and hard and that uncontrollable urge to push was happening with every one of them. Everything from this point is a blur. We made it to the hospital, my husband got me a wheel chair, some paramedics at the emergency entrance were trying to stop him, he quickly explained I was in labor and shoved past them, somehow I was making it to a bed. Things around me were all blurred, like I was looking through a tunnel. The pushing sensation was horrible, trying to hold it back made all the pressure want to come up my throat. They threw my legs into stirrups, someone had taken my pants off. The nurse said not to push, that I wasn’t quite all the way dilated. (Looking back, I happen to know she was lying, trying to stall until the doctor could get in the room, because as she said it she had a scared look on her face and was hurriedly putting on a gown like she might have to catch a baby.) And then the doctor was there, they told me I could push. I did, blessed wonderful pushing, 2 in fact and out she came. She was on my chest for only a second. I was so relieved that she was out, I was still dazed. I do remember thinking she was very red. There was something hanging off of her, birth stuff? There was a lot of it. The doctor cut her cord and whisked her away to the little cart on the other side of the room to be evaluated. Nobody said anything. Only my mom was saying something, asking for them to let me nurse her? I was very distracted by the doctor working on a vicious tear I had received. His needle in a very tender spot, supposedly to numb me, made me let out a blood curdling scream, louder than any moan I had produced while giving birth. He told me I should be numb, but I wasn’t. Everything was a mess and a blur and where was my little girl? I remember asking my husband if she was ok. He said yes, but something on his face told me no, she wasn’t. Something was dreadfully wrong, why else would he be so pale? Nobody would say anything except, no, I couldn’t hold her, they had to take her next door, yes, she was breathing. My mom told my husband to go with them, she would take care of me. Again, a very large chunk of this is missing from my memory. At some point a doctor came into my room and gravely explained that my daughter’s APGAR scores were wonderful, but there seemed to be a problem with her skin. The whole top layer appeared to be coming off, (what I had seen hanging from her at birth) this was serious, because she couldn’t properly keep her temperature stable and there was risk of infection. Skye’s very first picture, just minutes old. They wrapped her in plastic to conserve moisture and heat. “No ma’am, you don’t understand,” his voice was a thick East Indian accent, ” this is very serious.” I could barely understand what he said, let alone process it. I didn’t understand. I was still dazed. Fear hadn’t set in because I still had not seen or held my baby. At this point I was beginning to feel like the whole thing was a very bad dream, it was very surreal. They told me she would be transported to Kosair’s in Louisville, an hour and a half away. I couldn’t go with her because they could not discharge me for at least 24 hours. My husband agonized about staying with me or going with her, but that decision was not at all hard, I quickly insisted he go with my baby girl, I could take care of me, she was helpless. I begged them to let me see her. They told me she was being wrapped in gauze to protect her skin but they would bring her in for a few minutes before she left. An hour later I got about 90 seconds to see my baby. She was wrapped like a mummy in gauze from head to toe. Only her eyes were showing and her nose. She had her daddy’s nose. She was in an isolet but they allowed me to briefly touch her gauze wrapped hand, then she was gone. Seeing her like that was hard. Something sunk in, some of the gravity of her condition, but not nearly enough. I was scared, numb – and then I was alone. My husband went up to Louisville, my mom had to go home and attend my young sisters who were waiting to hear about their little niece. I was left alone, unable to be discharged until the next day. This story would be far too long if I focus on every aspect of the hell I went through with fear and hospital misunderstandings that led to me having to talk to a social worker about possibly abusing my child in utero (long, ridiculous story), but instead I want to focus on Skye. Upon arriving at Kosair’s the next day, I immediately wanted to see my baby. She was wrapped in her gauze, her color had gone from fire engine red to pink, but you could see that the top layer of her skin on her face was raw under the protective vaseline. They told me her entire body looked as bad or worse under the gauze and most of her beautiful hair and scalp was peeling off. I looked at her and cried. She was sedated with pain medication and looked peaceful for the moment. My husband was the bravest man I’ve ever seen, he managed to completely hold me together as I threatened to fall apart. He took over the task of talking to the doctors and sorting through the technical medical language that I could not even begin to process. He had arranged for us to stay a block away at the Ronald McDonald House, (the most wonderful charity ever put together in my opinion) and he spoke so cheerfully to me, so optimistically, that I was able to take a breath and keep functioning. My function, it turned out, was pumping breast milk. In the face of utter helplessness, I could pump milk. I told myself she would need it now and for when she got better, and I pumped. I set my alarm to wake up and pump every three hours. I made myself eat because I wanted her to have plenty of milk. I made myself go to my room and rest because I needed to keep up my supply of milk. I pumped by her bed side a few times, but there were always so many doctors and specialists needing to see her or do a procedure, so most of the time I would walk back to the Ronald McDonald House and pump and then walk back to the hospital. The little bit of weight I had managed to gain in the last month of pregnancy was quickly gone. I made enough milk for twins. Tragically, she got very little of that love in a bottle that I very devotedly worked so hard to make available for her. She had eating problems and tummy upset because of her pain meds and constant problems with her feeding tube. She had many problems. How many of them were original is very unclear.In fact, everything about her condition was unclear and remains a mystery to this day. Countless doctors in 10 states were not able to figure out what had caused her condition and her medical file, thick as a big city phone book, still baffles doctors who have studied it to consult on my second and third pregnancies. Her white blood cell count was constantly way too low or way too high. The doctors didn’t know if that was because of her skin or if her skin was because of her white blood cell problems. She got daily blood transfusions. She could not gain weight, she had trouble keeping an even temperature, she developed respiratory problems from being stationary and on strong pain medicine, yet we couldn’t really hold her or pick her up because of the risk of infection. We could only touch her with sterile gowns on and masks while she was wrapped in gauze, and only briefly at a time because keeping the door open on her isolet made her temperature drop. She had to have her bandages changed daily, then they dropped it to every other day because the 3 hour-long process left her so exhausted and in pain that her stats couldn’t recover very well before it was time to do it again. It was a very tedious and heart wrenching process. They usually did it at night when there was less doctor traffic in her room and we usually weren’t there, I believe they timed it like that on purpose, now that I look back. It was something no parent should ever have to see. They told us that several times. Daddy holding Skye for the first time for a moment while the nurses changed out her bedding. The only chance I had to really see her body was during a dressing change though, so I was finally able to catch them doing one after staying with my baby for several hours one day. On day 11 I was alone, my husband had not made it to the hospital that day, I think being so strong had finally caught up with him, and sensing that, I was determined to stay extra long and read to our little girl, something he did every day. So I was there when the nurses came in to do her dressing change and they hesitantly asked if I’d like to be present. I answered yes immediately, they tried to tell me it was not easy, but I didn’t care. My little girl had to endure them, surely I could be there to comfort her with my voice, to hold her tiny hand, something I rarely got to do. That 3 hours is burned across my memory with blistering vividness. I have blocked out so much, but that dressing change remains seared in time and space within the confines of my mind. The nurses began by unwrapping her tiny body. She had weighed 5 lbs. 10 oz. at birth 11 days ago. I believe that at this point she was 4 lbs. 4 oz. As the gauze came off painstakingly inch by inch with 2 nurses working on her, I held her tiny hand and talked to her softly. That tiny 4 pound baby never cried. Even as little bits of her skin had to be separated from the gauze, she only grimaced and let out a few moans, she never cried. She looked up at me the whole time as if drinking in the sight of me. She knew my voice, she knew her mommy was there with her. She felt my latex covered finger in her hand. She had been given pain medicine, as much as she was allowed, but she wasn’t sedated. She was wide awake. She clung to my finger and stared up into my masked face for an hour as they unwrapped her. Her eyes were blue. Not the cloudy blue every new-born has, her eyes were a clear, deep blue. The only color I have found that can describe her eyes was a clear, liquid cerulean, like a September Skye when it is crisp and cloudless, so deep you could never reach the end of it. As I looked into those beautiful eyes so full of pain and trust and bravery, it was almost like I could not be looking into the eyes of an 11 day old baby, those eyes were the eyes of a very old, very tired soul. Yet they are burned into my memory as the bravest eyes I’ve ever seen. About the time they got her completely unwrapped, one of the nurses said, “How are you doing mom?” I guess I didn’t answer. Tears were rolling down my cheek into my mask and my face must have been very gray because both nurses suddenly insisted I sit down and wouldn’t let me say no. I remember feeling very light-headed and my world going partially black as I was pushed onto a nearby chair. Even as I tried to focus to keep from fainting I remember saying that I was her mother and she needed me to be there. They replied that she didn’t need me to faint and have them needing to attend me while she was getting sterile dressings changed. I agreed at that point, but my heart ached. Nobody else was there for her and I couldn’t even hold it physically together enough to see her through 3 hours of the hardest part of her day. The nurses let me sit for a minute, then they told me it would be best if I went and got some air. I knew the wrapping up part was even more tedious than the unwrapping, and my breasts were telling me pumping should have happened an hour ago, so I tearfully told my baby that I would be back later and went away feeling like I had completely failed her when she needed me most. That day should be one of the worst in my memory, yet it gave me the clearest picture of who my daughter was. Skye was much stronger than I will ever be. She was much braver. As I look back on that day and remember her eyes I know that my daughter was too special for this earth. You may think I’m crazy, that I’m biased because I’m her mom, but then you didn’t stare into those eyes and experience what I did. It was as if that 11 day old baby was not 11 days old. It was as if she knew far more than I ever will while I’m on this earth. It was as if time stood still because while I was told it was an hour, I cannot remember it as an hour, a few minutes, or a few seconds. It was as if she gave me a gift that day that was meant for me alone and even though I didn’t see it or recognize it at the time, I know that on day 11 as she lay in her isolet enduring that dressing change it wasn’t me being strong for her and comforting her, she was being strong for me and letting me know that no matter what, it would all be ok. It was as if she knew that she wouldn’t have to lay there much longer and she was at peace with it. It was as if Heaven was reflected in her eyes, as if the veil was very thin and I could almost peer through her eyes into another realm. To this day that 11th day, instead of being a horrible memory, is one of my most cherished memories, one that keeps me moving forward. On day 17, after a week of what seemed an upward turn, my daughter took a desperate turn for the worse. She had been doing so well, in fact, that my husband and I felt ok with leaving the city for the first time since she’d been taken to Kosair’s and we went to church with my mom an hour and a half away and stayed for the noon meal. We told everyone that day that Skye seemed to be doing much better and we took the first real breaths we had in weeks.However, when we got back into good cell service about 40 minutes from Kosair’s, we both got voice mail notifications and pulled the car over to listen to them. The NICU had been trying to get in contact with us for the last couple hours, they thought we should come in and see our daughter as soon as we could. My heart caught in my throat as we drove the rest of the way back to the hospital. By this time I was long over due to pump and it was getting painful, so upon arriving back in Louisville, Josh insisted I go pump and rest, he would check on the baby. He called me several hours later, waking me up, and said he was going to come get me and walk me from the room to the hospital. I knew something was horribly wrong, I was just afraid to think the words. When he met me he briefly told me what the doctors had told him. Skye was a lot worse. I could tell he was trying to be calm, but there was something in his voice that made me ask if I should call my mom. He said it was up to me. I immediately dialed her and she said she would be there as quickly as she could. As soon as I saw my little girl, deep inside I knew she was going to leave, but I pushed the thought away and refused to process it until my mom got there. Skye didn’t look so horribly different, just very tired and very pale and her stats were not very good. When my mom got there, we cried and we talked and we prayed for an hour or so. Josh and I knew, somehow. We knew it was time to let go of her. We prayed that God would somehow take her pain away and let us hold it for her, we didn’t want to watch her suffer any more. No sooner was the prayer across our lips than a nurse came and summoned us from the family waiting room. It was time to hold that pain. As I approached her room, it was like slow motion. I was trembling uncontrollably. Nobody had actually said “your daughter is going to die” but I knew that once I entered that room, I would leave it without a living child. Thank God my mom was there, she gently pushed me forward into the room. Within a few moments they were asking me if I’d like to hold her. I could not answer, I could not move, I wanted to scream “NO!” and run away, but my mom sat me down and manually held my arms open as they placed my baby in my arms, still wrapped in gauze, but with her IVs being removed and her oxygen tube pulled away from her face and no cords or tubes tangling around her body. She had her eyes closed and her breathing was very light. She weighed as much as a feather. I kissed her forehead. It was warm and soft. This wasn’t how I had imagined kissing my baby for the first time would be. She should have been on my naked chest, her perfect naked body against mine. She should be looking into my eyes as I cried tears of joy, not tears of the worst agony I had ever felt, or will ever feel. Instead, I kissed her fading features for several minutes and told her she could go, that it was ok, mommy and daddy loved her and didn’t want her to hurt any more. Then I gave her to my husband and he held her for the last moments until she very quietly and peacefully stopped breathing and her heart stopped beating. It was less than an hour into day 18, October 13, 2008. We never went to sleep before the clock struck midnight, so I will always remember it as 17 days. 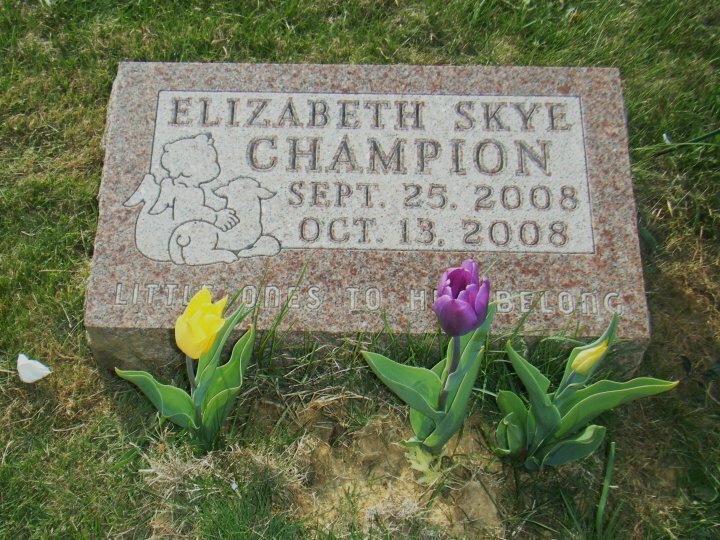 October 13, 2008 is when my daughter’s life on earth ended, but it’s where her story really began. You see, that 11th day as I looked into my daughter’s eyes, she had indeed given me something truly remarkable. In fact, she gave me many things, like a giant stocking full of many little delightful gifts. Skye gave me courage to go on in spite of unimaginable pain. She gave me a deeper love not only for my husband and family, but for other families who have gone through this agony and who continue to experience it daily. She showed me what it really means to fight, to go through pain and difficulty without complaint. She showed me how to hope, how to live, why living is so important, not just going through life, but being alive. She taught me that the unknown doesn’t have to be feared. So many, many things she taught me or showed me or gave me. Of course it took me a while to begin to recognize the gifts she gave me. There was a lot of grieving to get through. I still have days where I fall apart and relive the whole thing and cry buckets of tears, but that’s ok, because another thing she taught me was that remembering is the very best thing you can do. 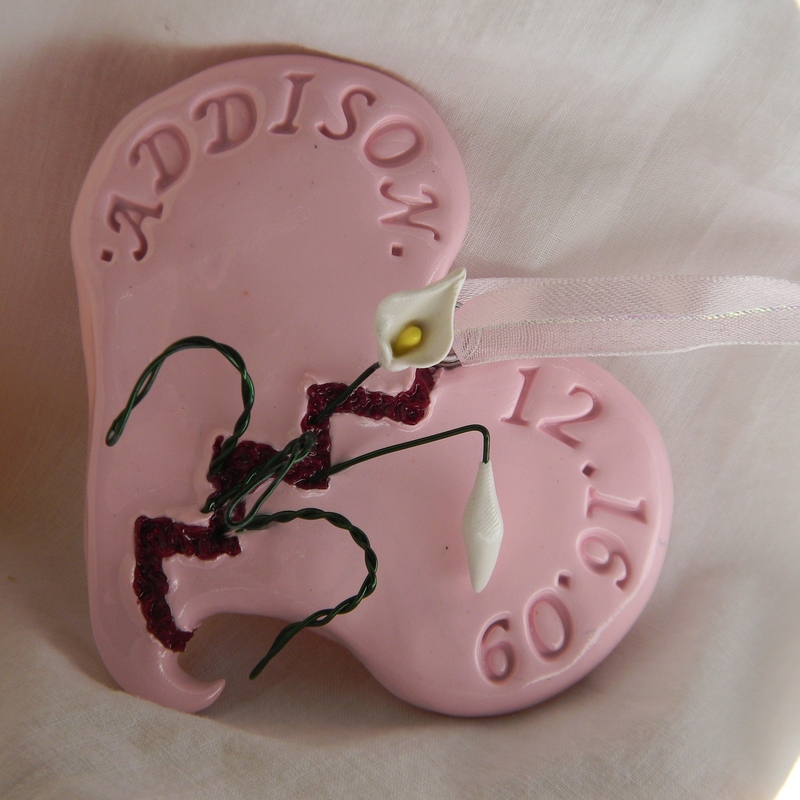 I take great pride in carrying on my little girl’s memory through my art. Skye Blue is named in memory of her, and so much more than a name, the meaning behind those words for me is monumental. I hope I have helped you get a glimpse of just how special that name is. The Christmas ornament donation program I started this year is just another way my baby girl reaches out even now and proves how special she was. She has touched more lives in her death than she ever could have in life. If I had been given more time with her, I wouldn’t know how precious every memory is, and the memories we weren’t able to make together make the memories I do have even more priceless. “In Memory Of” was specifically designed to reach out to parents who, like myself, were not able to make very many memories with their children. The ornaments I make and donate can never make up for those lost memories, but they help make new memories every year as you pull out the ornaments and hang them on the tree. They also give you the chance to bring out the old memories and dust them off and maybe even share them with family and younger siblings who didn’t get to meet their older sibling in Heaven. Remembering is healthy, its healing, it is the most tender, beautiful thing you can do for a child that has passed. I have been so touched in such a short time by being able to make these ornaments for beautiful families that have inadvertently joined me on this pilgrimage of sacred grief and beauty. One of the “In Memory Of” ornaments from my donation program. Fall is still my very favorite time of year. In fact, I welcome it now more than ever. I wait with great anticipation to see those one or two perfect September days, where I can look up at the sky and see the color of my daughter’s eyes again. This September 25th my little girl would have been 4. There is not a day that goes by I do not think of her and miss her. I would give everything to have her in my arms again, but since I can’t, this honoring her memory with Skye Blue is how I carry on her gifts of peace and purpose. Thank you for letting me share her story with you. Oh Natasia, how beautifully written. One can truly know you through this account of the deepest pain you’ve ever endured. It is so honorable to be able to bring so much good out of such sorrow. I love you so much and am so glad I was there for you. I will forever treasure the memories of that last night at the hospital and all our morning walks together. I know I fell apart in the worst way come December, but after reading this article, I feel I can have a better and more complete time of quiet and hopeful grieving because you have told the story so well. You are the most beautiful woman I know and just as Skye was/is your hero, that is how I have always felt about you. ❤ I love you mom, you really were a very important part of that night. I would have missed out on my very greatest memories with Skye had you not been there. Natasia, How beautiful this is written! I have cried like a baby reading it, while reliving all the feelings and heartache that came with losing Skye. I am so thankful that you have chosen to make something good out of our loss. I am so proud of you, and all that you are. I love how you choose to help others, and share their grief, even though it sometimes not easy. The greatest compassion comes from someone who’s been there, and is able to understand completely. I am thankful that this is not some sad story with a hopeless ending. When we see her again, she will be healthly and whole, and there will be no more goodbyes. I love you! ❤ Love you too! I am glad it has a hopeful ending also. I don't know how anyone can go on without hope or purpose. Written from the heart and peace in knowing she is in heaven with a new body. God bless you and Josh. As a long time friend of Josh’s family, I was heartbroken when this happened. I so admire the courage of Natasia in writing this beautiful story. As I cried I couldn’t imagine having to go through this but as I read the story, was so touched by the way you described the way this tiny gift of God comforted you and the continued faith and hope you have. You will all be together again someday as a whole family. I have been crying since I saw Skyes picture,what a beautiful little angel,who taught you so much in such a short time,we lost our 19 month old grandson Christopher(I called him Kissifer) he loved to give Kisses.Its been years and he is still missed and loved everyday.Eight months and 10 days ago I lost my son Jack,the pain is horrendous.I feel sad for your loss but it seems like you were truly blessed with the time you and your daughter had togeather..